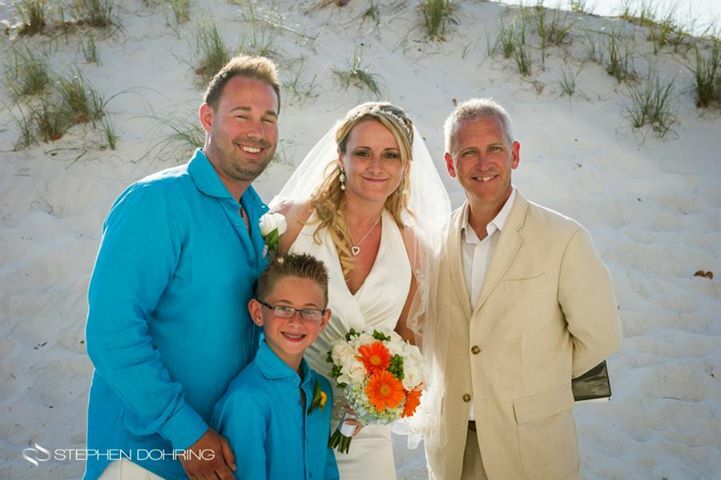 It was a picture perfect day at The Sandpearl Resort on Clearwater Beach on Saturday, May 18, 2013 for Lucie and Jeff’s destination beach wedding! Lucie looked amazing as she was escorted by Jeff’s father across the white powdery sand to join Jeff under their wedding canopy, where Nicholas, Lucie’s son, “gave her away”. There, with an amazing view of the Gulf of Mexico as their backdrop, and in front of their family and friends (and lots of beachgoers and hotel guests! ), the couple shared their vows, exchanged rings, and were pronounced husband and wife by Rev. Rick Lackore of Sensational Ceremonies, LLC . Venue coordination provided by Diana Cardenas and the rest of the staff at The Sandpearl; Videography by Heart’s Video; Florals, décor and wedding coordination by Barb Oehlerking, Wedding and Event Stylist with Artistry Designs Group; Wedding Photography by Stephen Dohring. Congratulations to the new Mr. and Mrs. Jeff Reetz!